The Second SIM Case is the ideal accessory for those who want to use two different phone numbers on their iPhone 8/7/6s/6. Thanks to the Go Phone application, you can manage another SIM when inserted into this cover. Using this cover’s features is really simple: simply insert a Nano SIM into the dedicated slot. Connect using Bluetooth the cover of your iPhone 8/7/6s/6 and manage it using the free Go Phone app. Then you can use your Apple device with two numbers: for example, one business and the other personal. While the Second SIM Case is in use, you can simultaneously connect other accessories such as speakers and earphones to your iPhone via Bluetooth. The SIM in the cover slot can be used as a telephone line and for sending SMS. The battery can be recharged inside the cover thanks to the Micro USB cable included in the package. 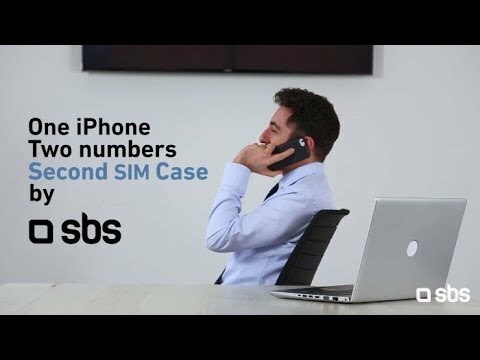 The Second SIM Case offers you the convenience of having two telephone numbers on a single iPhone. Find out how useful it is to be able to use one device for both work calls and personal use. If you are taking a call through the Second SIM Case and receive a phone call on the main SIM, or the one inserted in your iPhone, the phone call in progress with Go Phone is interrupted, giving the main line priority. If, while talking through the main line, you get a phone call on the SIM inserted in the Second SIM Case, the busy or unavailable tone will sound.